Which bike bag is the right one? The market for bike bags is huge. We generally distinguish between handlebar bags, pannier bags (bags that sit on top or on the side of the pannier rack), seatpost bags, frame bags for installation inside the frame triangle or on the top tube and lowrider bags for attachment to the front wheel. 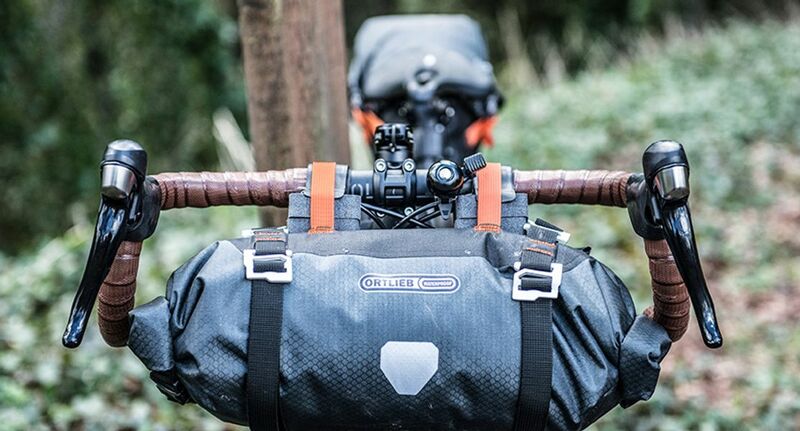 A bikepacking kit traditionally consists of a handlebar bag and pannier bags. This setup can of course also be upgraded with a variety of other bags. If you expect the weather to be bad on your tour, you can also choose from a wide range of waterproof bicycle bags. What are the different types of mounts? The best way to mount handlebar bags is to use a mounting bracket that allows you to quickly remove the bag whenever you want. Thus, you can take your valuables with you when stopping at a café. Therefore, practical (and partially lockable) quick release systems e.g. by KLICKfix are highly popular among cycle tourers. While the mounts are permanently installed on the handlebar, you can easily and quickly remove the bag at any time. Pannier bags on the contrary can be attached to your bike in many ways. If you want to carry heavy loads, you should make sure the mounting system is also robust in the lower area, so that the bag cannot hit the spokes. That's why ORTLIEB's QL2.1 and QL3.1 systems are very popular. Here, too, the mount is permanently fixed and allows for easy removal of the bag. Those who have a system rack such as a racktime rack can also use bicycle bags with an appropriate adapter. Seat post bags and frame bags mostly come with a Velcro strap that provides various mounting options on different types of bike frames, as well as a secure hold on rough sections. How much volume should my bike bags have? Whereas you only require a small bike bag, e.g. a handlebar bag, on short bike tours, you need more volume to store your clothes and gear on longer tours. Therefore, we also stock three-part heavy-load bike bag kits with a volume of up to 60 or 70 litres – this helps you stow away all your gear. What should I pay attention to when packing the bags? When packing your bike bags, you should make sure they distribute the load evenly across your bike when fitted. Thus, the right and left pannier bag and/or lowrider bag should almost weigh the same when loaded to provide the stability you need on your tour. Please also bear in mind that some pannier racks do have a maximum load limit that must not be exceeded. Nils Böing, Purchasing Manager of ROSE, recommends: "Those who plan to go on a big MTB tour should go for the new generation of bikepacking bags. Some highlights: Our reinforced TRAVEL saddle bag with a volume of 8.8 litres and the TRAVEL handlebar bag with 9.4 litres of volume."